"These cookies melt in your mouth." In a small bowl, dissolve baking soda in milk. Cream together the sugars and the egg. Mix in the oil, butter or margarine, baking soda mixture and cream of tartar. Stir in the vanilla, oatmeal, coconut or chopped nuts, corn flakes and flour. Make small balls and flatten them with a greased and flat bottomed glass. Bake 325 degrees F (165 degrees C) for about 12-15 minutes. My son: These cookies are great! My husband: Crunchy but chewy These have a nice texture. These cookies were too dry and lacking in flavor. They also didn't want to stay together. The flavor of these is very good, but the texture is kind of greasy. 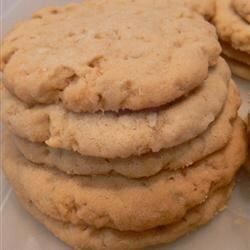 The cookies aren't chewy, rather they're crumbly like old shortbread cookies, leaving a greasy feel on your fingers. Name says it all! Makes a ton.